On the rocks at Hotel Puerta América, Madrid. It pours pale golden with some greenish streaks. Aroma is rather low and very sweetish: Bazooka gum, cherry candy, caramel, vanilla... and a hint of spruce. Mouthfeel starts sweetish and warm, developing into an oily and smoky taste. Finish is rather long, bitterless, with new tinges of bubble gum. Also early in 2016, in a transaction that brought me a couple of bottles of Benromach 100/10 (one is now history), my brother muled me a couple of MOM 30cc samples of Blanton’s Straight From the Barrel. Around the time that I got those bottles to @paddockjudge he was kind enough to provide me with this sample (from what he called an exceptional batch), which would be my first taste of the Original expression. Last night, September 2, 2018, I finally got try this and the SFTB in an epic video tasting of three Blanton’s expressions. This expression is reviewed in my usual manner, in a Kentucky Bourbon Glass, allowing it to settle after which I take my nosing and tasting notes, followed by the addition of a few drops of water, waiting, then nosing and tasting. Nice, fruity, vanilla, butterscotch. Rich nose. Spicy. caramel and vanilla. Some cherry. A little hot. Soft on the arrival, then becomes spicy in the development and then the heat kicks in. Water smooths it out a little. The nose and the palate complement each other. When tasted after the SFTB, the flavours become a lot thinner. I liked this a lot more BEFORE I tasted the Gold and the SFTB. Would I buy this whisky? This barrel? Absolutely. Another barrel? Given I have so many bourbons already, I would try before I buy. @Nozinan, thanks for your review. In my very early serious bourbon days I didn't care for any of the Blanton's I had had for the first 2-4 years, in the years 2007-2011. In this case I think that it was mostly due to an evolution in taste that my opinion changed. I think that my tolerance grew for certain of the Blanton's flavours, especially what I perceived as hickory wood, heavy char, and licorice. When my wife's brother gave me a 375 of the Original in about 2012 I thought, "Oh, here he goes again, giving me one of the few whiskeys I don't like!". But that bottle was GREAT, and it effected a total change from my prior reactions to Blanton's. That bottle was so good that it was gone very quickly, a rare occurrence for a bottle of whisk(e)y in our house. So when I read your score of 87 points for Blanton's Original I think to myself that at one time I would have rated it at 75 points and at another time I did review and rate it at about 93 points. Single Barrels are very common nowadays. But it was Colonel Albert B Blanton of the Buffalo Trace Distillery that first released a single barrel bourbon less than a century ago. The marketing fellows will have you believe that the best casks mature in the middle of Warehouse H and that those are thus carefully selected to be bottled as single barrels. This is barrel #147. Clean and surprisingly fresh nose on oranges and lime juice, caramel and vanilla, but also something that reminds me of red fruit. Some cinnamon and aniseed. Milk chocolate. It could do with a little more body. Candy-sweet! Think parma violet, but with spices. Cloves, nutmeg and vanilla. The fruit cannot compete against the caramel and candied sugar. Very sweet. The finish is medium long and – after an initial burst of spices – offers some more citrus fruit. Pleasant bourbon is a beautiful bottle (but very hard to pour from). I just finished a bottle from warehouse H. I enjoyed mine more than you did. I got a lot of fruits and berries in mine. I figured i would do a third BT product this week in keeping with the theme. Blantons Original Single Barrel is a Buffalo Trace distillery product, under the Sazerac Company. It is Buffalo Trace mash bill #2, which is believed to be a higher rye mash bill (I've seen estimates of 12-15% rye, 5% barley) than mash bill #1. This whiskey has become harder to find in many areas and is often seen at ridiculous and inflated prices. I paid about retail for this last month at $65+tax. Bottle has been opened for a few weeks and is 80% full. Sample is in an Arran style Glencairn. Nose neat: Takes some time to open up. When it does, I get fruity notes strawberry, raspberry and blackberry. More so of strawberry. Also notes of honey, vanilla, and the inside of an acorn. Some more time reveals a wee hint of smoke and butterscotch. It takes some time and its still a bit closed but nice nonetheless. Perhaps a drop of water will open things up? Palate neat: Honey! Lots of honey. Vanilla. Then loads of fruit jelly. Apricot and strawberry jam to be more particular. Near swallow I get a tad bit of chili pepper spice. Very enjoyable and opens up more than the nose. Finish: Finish is oakier and drier. Not as fruity, but spicy, peppery and oaky. A nice way to balance all the sweet fruit and honey out. Short-Medium in length. Nose w/water: Really not much change in the flavours but it does open it up a bit and brings out the grains more. Palate with water: This was a mistake. The lovely fruit jams are gone and I'm left with the grains. Wait...some time lends itself out some grapes. So we went from strawberry and apricot to grapes. Interesting. Finish w/water: Spicier, less oak. Overall: A much better BT experience than my last two reviews. I would summarize the flavours thusly: Buttered toast with fruit jellies, honey and a dash of chili pepper. Much better without water. When I first tried Blanton's Original I was not taken with it, as the months have gone by and I have returned to try again and again it has developed into an awesome bourbon. Many people say the Woodford's is quintessential bourbon but you can give me Original over it everyday it does not do anything special but what it does it does well, the balance of this is an absolute treat. Fruity sweetness, dry oak, caramel and vanilla with a long finish, ten minutes after the last sip tonight I can still taste the vanilla and fruit. Definately give this one a bit of time and you will be rewarded with a delicious bourbon. Hope the straight from the cask comes on as well as this, it was closed when freshly opened with a number of friends, 2 months on it has been left alone with only half a bottle left. I think I might just have a sniff tonight to check how it is developing. I advice you to buy a bottle of Blanton's Original Single Barrel. First, you will just be astonished about the bottle. You'll just hold it and stare it for a moment. After you taste Blanton's Original, you will still feel amazed. For a brief moment I felt like Bret Maverick (from the original Maverick TV series) about the whole experience. Classy stuff: the bottle design, the content, everything. The one I'm reviewing is Blanton's Original Single Barrel 41. Dated 4-10-2013, bottle number 81. And I love it. And for this price, I'd even settle only for the empty bottle, it's just that cool. Nose: Hot spices start the show. Pleasantly continues with lingering waxy honey and oranges and hints of caramel. Taste: Oranges and hints of very watery melon. Spices and vanilla complete the nice palate. Finish: Spicy hot and bitter and dry. Chili with dark chocolate and oak. Balance: Great stuff, nice mix of hot spices and lingering sweetness! Warehouse H delivers! @Rantavahti, thank you for your very nice review. I am glad that you have been enjoying your Blanton's Original. Concerning the addition of water I just suggest careful gradualism. When I add water, it is literally 2 drops at a time. But then I only add water sometimes, maybe about 1/3 of the time (more frequently for the purpose of review writing), and usually then only for the very high proof products, which, for me would mean over 60% abv. But I am sure that you can get some interesting variations in flavour from adding a couple of drops of water to a 46.5% abv bourbon whiskey. Having been raised Roman Catholic, the Blanton's bottle reminds me a lot of a glass version of the ciborium, the gold-plated vessel in which the sacred Eucharistic wafers are stored. The ciborium would be slightly different in that it would flatten out toward the superior (uppermost) aspect and covered by a lid which would usuallty be flat or close to flat. Some designs of ciboria will have significant curvature in the upper half of the vessel, though, rather than being flat. NOSE The bourbon spice dominates the nose and it takes a second to find anything else. Caramel, maraschino cherry, cinnamon, some vanilla and a little corn come out once it settles. I don’t really smell much oak and there is a wheat like sweetness permeating the entire nose even though there isn’t any in the mash bill. TASTE Caramel is upfront with a rich bourbon spice riding shotgun. Citrus zest (orangish), cinnamon, hint of vanilla and a mild oak fill in the backseats and this buggy is rolling. FEEL A little rougher than I would have imagined (or remembered previous bottlings being) but still easy to drink neat. FINISH Corn, caramel, malt and wood combine and fade on a shockingly short finish. @MaltyGirl Thank you. To me it tastes much more like the standard Buffalo Trace offering, which technically it is and just comes from the premium mid-rick selections. Once again it's getting close to the time where my wife is going to start her world famous ribs which feature bourbon as a glaze. The bad thing about these ribs is that they use bourbon which means it's bourbon I'm not drinking. The good thing about these ribs is that they use bourbon which means I get to go out and buy a bottle or two of bourbon. So I always grab a new and different bourbon each and every time, and even better I have the wife's permission to buy a new bottle of whiskey! Last Saturday I went out and picked up a bottle of Blanton's Private Reserve Single Barrel, paid about $65 for the bottle, which is all special and cool looking as it resembles a globe that's been angled, or cut, or god I just can't explain this, it's very frustrating. Suffice to say the bottle is very striking and pretty. The whiskey is bottled at a higher abv then the normal entry level Blanton's. 46.5% vs 40%. And is bottled on April, 23, 2013, from barrel # 198, where it had been stored in warehouse 18 on rick 17. Whew! Did you get all that?! The whiskey is very very dark, if it was a single malt you'd say it'd spent 20 or so years in a sherry cask. The whiskey has thick thick legs that just oooze down the side of the glass. A sweet nose as so many bourbons often have, with heaps of vanilla, cinnamon and red vines coming off it, but there's also apples, toasted oak, nutmeg, citrus, and caramel. Let's have a taste shall we? Very sweet, delicious, but very sweet. Red vines again, citrus, honey, chocolate, toasted oak, vanilla, very creamy. A mild finish, full of vanilla and chocolate ends this whiskey. Around $65 to $75 a bottle (AUS) which is reasonable considering how tasty this whiskey is. Be warned though, it's very very easy to drink. This is one of two bottles I was able to procure from a buddy of mine who flew in from Shanghai a few weeks back. While both were overpriced by American standards, I consider fine bourbons and ryes to be nothing short of exotic in this corner of the globe. The first bottle he brought back was a Willett’s rye. Absolutely sublime stuff. This is the second; Blanton’s Original. I was going to get the Special Reserve instead, as it is priced cheaper here in Asia, but I figured I’d start with the signature bottling. Let’s hope it’s a worthy follow-up to the Willett’s. Nose: Quite a strong whiff of maple syrup hits me first. It’s a clean sweetness that isn’t overbearing. There’s also a fair amount of rye. Very lovely oak with hints of cedar shavings. Vanilla, smoke, spearmint, brown sugar, red apples, cinnamon and melon. Crisp, with good intensity. Palate: Medium body, with a very clean delivery. Rye spice and spearmint dominate. Oak is here, but it’s not as strong as you’d expect. The flavours seem to follow through from the nose. The sweetness here is gentle and sophisticated, and mingles nicely with the rye notes. Smoke and spice bring us into the finish. Finish: Rye notes in droves. Nutmeg, cinnamon, and anise. Then maple sugar, then distant wood. Medium-long finish with a beautiful burn that’s by no means harsh. What I particularly like about this bourbon is its crispness. It’s also quite intense. Its charm seems to stem from the fact that the flavours here are so precise and well-defined. I also like the sweetness here, which is neither cloying nor thick. Lovely maple highlights. Finally, the heavy wood notes present in other bourbons seem to have been largely exchanged for the grassy, spicy rye notes. There is indeed good oak and cedar flavour here, but it’s not dominant. Ultimately this is a lovely single barrel bourbon that has a crisp and sophisticated delivery. And rye lovers won’t be complaining, either. Of the three expressions that I have tried, I find Gold the most to my liking. - hoping to try the cask strength sooner rather than later. Perhaps a visit to the bourbon capital of the world might allow for that. @Paddockjudge, unfortunately, the cask strength Blanton's is available only in international markets (Europe and Japan) and some duty free shops. It's a pain. Nose: Really nice and simple. This smells "golden": honey, light rye, vanilla, sweet shaved wood. More rye. Simple, but very good. With time caramel covered green apples (or very acidic red). Palate: Simple and straightforward here, too. Caramel, honey, vanilla, rye spice, and some wood. Really nice. Short notes here because it really is just simple and straightforward. The color is a reddish amber, since my tablet can't slide the color. I am going to describe the palate, nose, and finish in 2 ways neat and with a splash of water. Nose: strong burn, with rye fruitiness and maybe orchard fruits, vanilla, and some caramel. Palate: spice, vanilla, oak, fruits maybe apples, and some rye. Finish: vanilla, oak, and fruits. With water Nose: The alcohol burn is almost nonexistent, Vanilla, oak, caramel and fruit. Palate: Dark Fruits, vanilla, spice, charred oak, rye and a hint of chocolate. Finish: Vanilla, spice, fruit and a flavor I can't describe the final feel maybe some mint. Very pleasant nose with evidence of sweet citrus. Incredibly long legs that stick to the glass indefinitely. Silky smooth texture again with mild citrus and vanilla undertones. The finish is moderated and warm with more of a growl than a bite. Overall, very enjoyable. I love this whiskey! The experience starts right at opening the box. The presentation, colour, the little horse. I was sold before I even nosed the whiskey. As anticipated, it was a statement of bold authority. It also helped that it was my first ever bourbon. Great review! Blanton’s Original Single Barrel Kentucky Straight Bourbon is made for Age International by the Buffalo Trace distillery, from their high rye mash bill. I have previously reviewed two other bourbons produced using the same mash bill: Elmer T. Lee (connosr.com/reviews/elmer-t-lee/…) and Blanton’s Special Reserve (connosr.com/reviews/blantons/…). The nose is immediately sweet, bready, and spicy. It is heady, with dominant notes of menthol, leather, and pipe tobacco. Hints of pepper, oranges, apricots, and strawberries make themselves known in the background. In time, it deepens further, eventually yielding vanilla and brown sugar, contrasted with the slight astringency of furniture polish. The palate is equally rich and full bodied. It is spicy and warming, with a nice sweetness. There is dry rye, a light nuttiness, gentle astringency, and sumptuous touch of orange liqueur. In all, it is exceptionally well balanced. The central difference between Blanton’s Original and Blanton’s Special Reserve—aside from the color of the labels, of course—is the proof, the former being 93º and the latter 80º. While perhaps not a profound difference in profile, it is nevertheless a significant one. Everything that makes Blanton’s Special Reserve interesting is made considerably more impressive in the higher proof expression. Compared to the 90º Elmer T. Lee, however, the differences are more subtle: Blanton’s Original is drier and smokier, though it is neither especially dry nor smoky. It is as if they are two sides of the same person; at times sweet and playful, stately and mannered at others. This sort of complexity makes me wonder what else Buffalo Trace has up its sleeve. @abunadhman, you are quite right that this whiskey—and most, in my experience—benefit from some "air time." The vast majority of my reviews, including this one, are actually on bottles that have been open for some time and are sampled repeatedly (early, mid, and late samples) before I write my reviews. I keep detailed notes and update them over time; aspects that are reliable/repeatable are usually mentioned first, as "dominant" or "recurring" notes. Make no mistake: a score of 86 reflects a strong showing to me. I think this is truly good stuff. 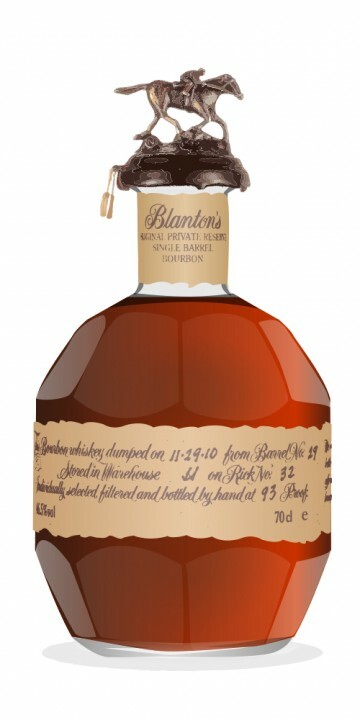 Blanton's Private Reserve Single Barrel Bourbon, dumped on 3-8-12, Barrel No. 271, Stored in Warehouse H on Rick No. 10, bottled by hand at 93 proof. 46.5%vol, Registered Bottle No. is 297 and of course other promo. stuff and addresses etc. Surely no other maker provides as much info. I have been wanting to try this bourbon for some time - what a great bottle, great history (created by Elmer T. Lee) and growing in profile. Good legs in the glass, a sharp coppery amber colour. Beautiful oaky nose of cinnamon, burnt sugar, vanilla and some orange in the background. And underneath some bacon? Speaking to it's creaminess, methinks. Lovely palate, oily but not too oily (it nicely coats the mouth), a little spice, sweet vanilla and oak. Some cocoa and mint in the background (an After Eight?) Excellent balance between the notes, and all is improved with a little water, which brings out the subtle cinnamon and orange. Long, developing finish. Very nice bourbon, but not sure yet if I prefer this over the oakier bursting Baker's 7 Years Old. I'll need to compare and contrast a little bit more! Very balanced - one of my personal favorites. General remarks about Blanton's: this bourbon is elusive, yet familiar. Each glass has the comforting characteristics of the previous; yet, new fragrances arise each time that are a bit surprising. For this review, it had been about 3 weeks since my last glass of Blanton's. I had just had a ham and pickle wrap with fresh raspberries on the side. Nose: cedar, definitely 'woody'-- surprising-- since I normally get whiffs of vanilla and bananas--not this time. Tricky little devil I tell you. Palate: A rush of cinnamon, banana, spicy, sweet. Dare I say warm apple pie, sans much apple? Final remarks: In the past I have found Blanton's to be a tad sweet for me, but I rather enjoyed it this time. Definitely keeping it around now that cooler weather is coming. Can I just say I love this review. Yes, yes I can. Back in 1984, Blanton’s was the world’s first single barrel bourbon. It means every batch will be slightly different and each of the characteristic bottles bears a bottling date, barrel number and warehouse indication. Did you know there are eight different signature stoppers, featuring a racing horse in different strides, each with a single letter of the name Blanton’s? Regardless of the bottling strength, all versions have the same mash type, cask charring and maturation. Nose: fairly dry for a commercial bourbon and quite spicy (cinnamon, pepper), with leather and maple syrup standing out. Almonds and marzipan. Burnt sugar. If you swirl it around, sweet marmalade and toffee appears. Fresh oak and hints of mint as well. Less sweet and less vanilla than I expected, but very good. Mouth: a weak and rather vague attack, smooth but not as full as I hoped (maybe a higher strength could solve this). Very minty with other spices following quickly (pepper, cinnamon, nutmeg). Cough sweets. Big (charred) oaky flavours. Tobacco. Missing some roundness. Pleasantly dry, oaky and spicy on the nose, but maybe a tad too much of all that on the palate. Still a nice bourbon. Decent start to the higher end bourbons but dominated by corn from start to finish. Slightly limited in scope but would be good to mix perhaps. @tabender, you might consider trying Blanton's over a few different days, and then include additional nosing and tasting experiences. That would give us more information to see where you are coming from on this. Which high-end bourbons do you like better, and can you say why? Blanton's from 2 bottles have I sampled. I actively disliked both. Having said that this bourbon is so popular in some circles that there must be some barrels out there somewhere that I would like. A friend of mine dropped by after his trip to the US, and he brought back a bottle of this and was kind enough to let me have a glass. This was my first top shelf bourbon, so I was really intrigued! I also loved the bottle, and the very cool stopper (and there is a fairly cool story behind the stoppers of the various Blanton's bourbons - head to the Blanton's website for more info). The nose was very fresh, rich and creamy, but not overly powerful - if my nose was more than about a foot from the glass I didn't get very much. Any closer though, and it was wonderful. Cut grass, caramel, sweet corn, old leather, tarry tobacco with hints of orange zest. Very nice, I could have taken whiffs of it for hours. The taste was more subtle and smooth than the nose, and took a couple of sips to really open up. All of the ingredients from the nose were there, but with more emphasis on the orange zest, caramel and tarry tobacco with a bit less cream and cut grass. I found myself wanting to keep sipping this one - really engaging. The finish was fairly short (which made getting back to the sipping very tempting), and started full of orange zest, caramel and sweet corn, before creamily fading. A longer finish would have bumped this up by a half point or so, but this was very easy to drink, and wonderfully tasty, and as a result I now have a hankering to start looking into top shelf bourbons! Nose: spicy orange skin with a bunch of molasses and vanilla. Hints of honey. The corn is easy to identify. After a while, there are hints of pine resin. Maybe not as expressive as some other bourbons (Buffalo Trace is my benchmark for standard bourbons) but nothing to complain about either. Mouth: the pine resin grows stronger (maybe a tad too much now). Quite some caramel rounded off by vanilla. Still some orange notes and spices (clove, hints of mint). Finish: short. The flavour profile from the palate falls down too soon. A rather soft bourbon, easy to drink but lacking some balance and punch in my opinion.